How are College Educators Using YouTube? 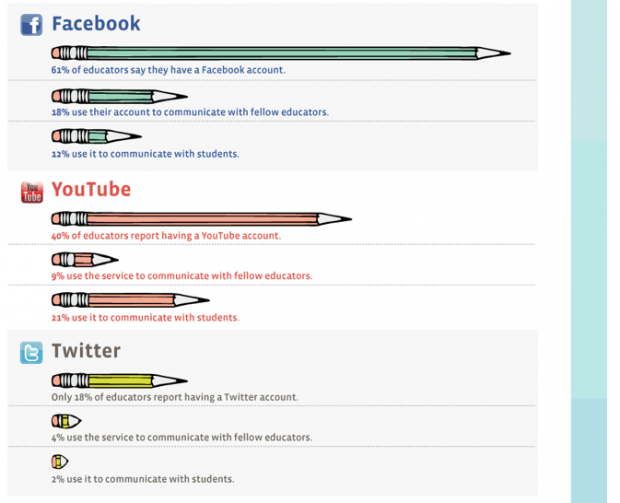 This is just part of a fun infographic on MindJumpers depicting different studies about how college educators are using social media. The one that stands out: 40% of educators report having a YouTube account. I'd love to know how college professors are using YouTube in (and out of) the classroom. More than 90% of faculty use social media either for professional purposes or in their classes—or both. Nearly two-thirds of all teaching faculty have used social media in their class sessions. 30% have posted content for students to view outside class. 40% of faculty have assigned students to read or view social media as part of course assignments. 20% have assigned students to comment on or post to social media sites. 80% of faculty report using social media for some aspect of a course they are teaching. Of the 80% of faculty who’ve made any use of social media as part of their courses, virtually all include some form of online video use. One-third of faculty restrict their social media use to only online video, but nearly one-half use other forms of social media in addition to online video.